Los Angeles Bootie LA: APRILWEEN!! Sick of the crowds on Halloween? Then come to APRILWEEN! Dress up in costume for a chance to win cash prizes in the Midnight Costume Contest! 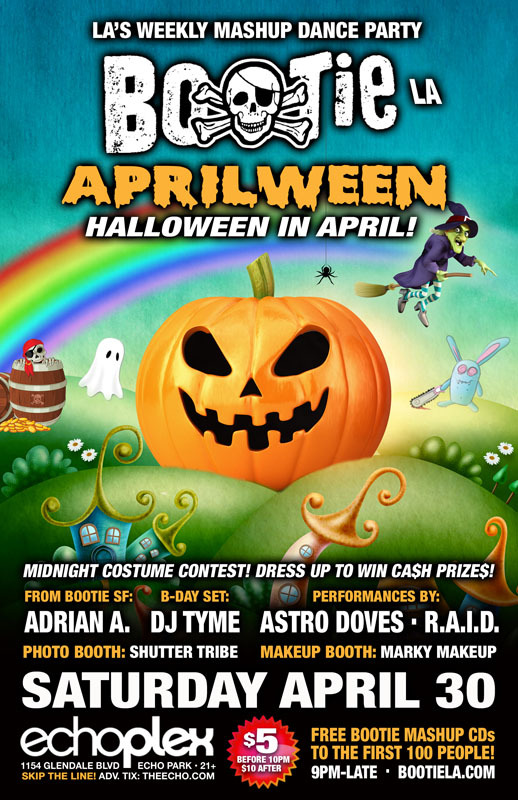 Adrian A. comes down from Bootie SF to throw a few wickedly fun Halloween mashes into the mix — plus DJ Tyme (of Entyme) celebrates his birthday! Astro Doves spin like beautiful witches performing pole acrobatics, while resident dance crew R.A.I.D. throws down spooky go-go insanity, Marky Makeup gives creepy make-overs, and Shutter Tribe captures it all! Plus FREE CDs to the first 100 people through the door!